Los Angeles uses another relentless hitting performance to take a commanding advantage. LOS ANGELES — Yasiel Puig’s bloop single didn’t even drive in a run. He still flipped his bat, sprinted to first and triumphantly pointed back at his dugout, where the cheering Los Angeles Dodgers pointed right back while the crowd chanted his name. Some of baseball’s norms just don’t apply to the exuberant Puig. Or to the Dodgers, who are getting huge offensive contributions from practically every spot in their lineup. The Cuban slugger is just one purring component of a machine that has the Dodgers on the brink of an even bigger celebration. 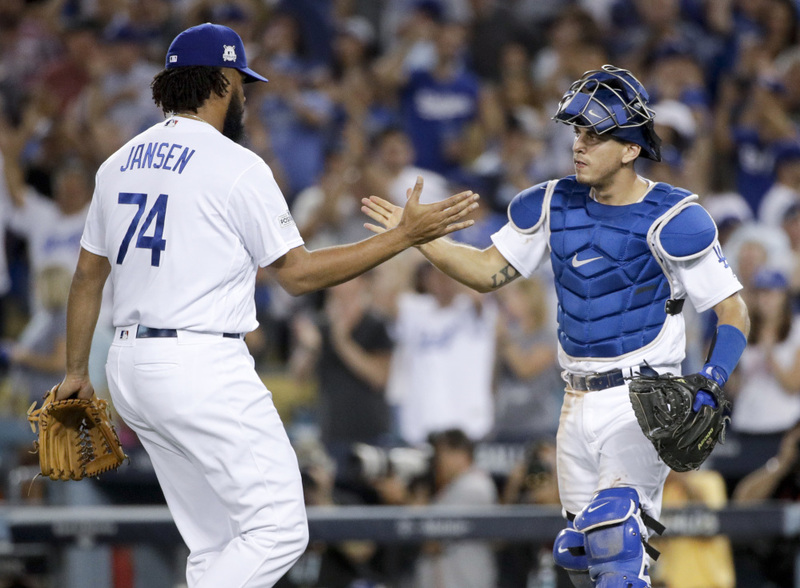 Puig had three hits and drove in two runs, Austin Barnes added a key two-run double and the Dodgers used another relentless hitting performance to beat the Arizona Diamondbacks 8-5 on Saturday night for a 2-0 lead in their NL Division Series. Logan Forsythe had three hits and Kenley Jansen earned a flawless five-out save for the 104-win Dodgers, who have made their mediocre pitching irrelevant by pounding out 17 runs and 24 hits in the first two games against their NL West rival. The Dodgers have the majors’ biggest payroll, but their offense is coming from players of all salaries and pedigrees. And even when the heart of the Dodgers’ order produced little in Game 2, their 6-7-8 hitters – Forsythe, Barnes and Puig – were spectacular. The trio reached base a combined nine times, and Los Angeles turned an early 2-0 deficit into a 7-2 advantage with three rallies, capped by a four-run surge in the fifth. Barnes, usually the Dodgers’ backup catcher, reached base three times and got the night’s biggest hit with that fifth-inning double. 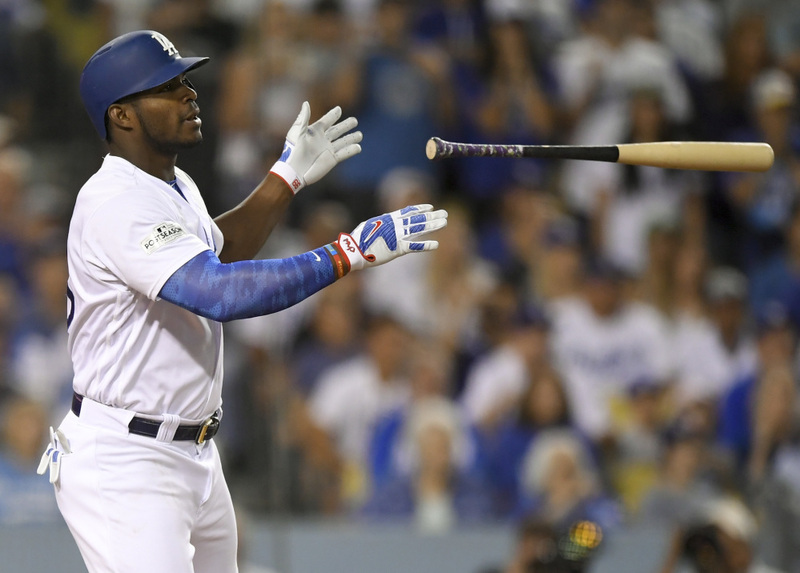 As for Puig, he has five hits, four RBIs and an uncountable number of tongue-wags, bat-licks and obscure celebratory gestures in just two games. Paul Goldschmidt hit a two-run homer in the first inning and Brandon Drury added a pinch-hit, three-run shot in the seventh, but the Diamondbacks are on the brink of elimination after Robbie Ray and reliever Jimmie Sherfy couldn’t contain the Dodgers’ lineup. Arizona actually has six homers in the series to just one by the Dodgers, who scored eight runs in Game 2 with only one extra-base hit. Game 3 of the best-of-five matchup is Monday at Chase Field. Arizona ace Zack Greinke will attempt to save the season when he faces his former teammates with the Dodgers, who counter with late-season acquisition Yu Darvish. Greinke is probably the Diamondbacks’ best chance to stop the Dodgers from scoring their way out of every problem. “If you’ve got to pick one guy to stop this situation we’re in, I think we’ve found the right guy in Zack Greinke,” Diamondbacks manager Torey Lovullo said. Ray had been outstanding in five regular-season starts against the Dodgers, but he had just two days of rest after pitching in relief during Arizona’s wild-card win over Colorado, and the left-hander struggled mightily with his control from the first inning. Ray walked four of nine batters early on, but the Dodgers didn’t get their first hit until Forsythe, Barnes and Puig delivered consecutive singles in the fourth in a go-ahead rally. Drury kept it close with his no-doubt shot in the seventh on Brandon Morrow’s first pitch, but the Dodgers rallied for another run in the bottom half. Roberts went to Jansen after Daniel Descalso’s one-out double off Josh Fields in the eighth, and the vaunted closer reprised his multiple-inning dominance from last October, mowing down five straight batters, getting David Peralta on a groundout to end it. Justin Turner drove in five runs in the Dodgers’ 9-5 victory in Game 1, which began with a four-run first inning against Arizona’s Taijuan Walker. Turner went 1 for 4 in Game 2 and popped out with the bases loaded to end the seventh, but the Dodgers didn’t even need their slugging third baseman. Rich Hill made it through just four innings for the Dodgers, yielding three hits and three walks. The veteran struggled with his control and never found a groove, but stranded runners in scoring position in the second and third innings to keep it close. Kenta Maeda got the victory by getting three outs of middle relief. The Japanese right-hander didn’t make the Division Series rotation, but Roberts plans to use the 13-game winner as a specialist against right-handed batters. With 54,726 fans in attendance, the Dodgers had their largest crowd in Chavez Ravine since 2012, before renovations to the venerable stadium. The crowd also was one of the season’s loudest, egged on by Puig’s enthusiasm and by Hill, who held up a cardboard sign in the seventh inning exhorting fans to get loud. Greinke couldn’t make it through four innings in the Diamondbacks’ wild-card game, but nobody around the Dodgers doubts the $206.5 million right-hander who won 51 games in three years with Los Angeles. Darvish went 4-3 with a 3.44 ERA in two months with the Dodgers, but the Japanese star yielded just one earned run in 19 1/3 innings over his final three starts before the postseason.